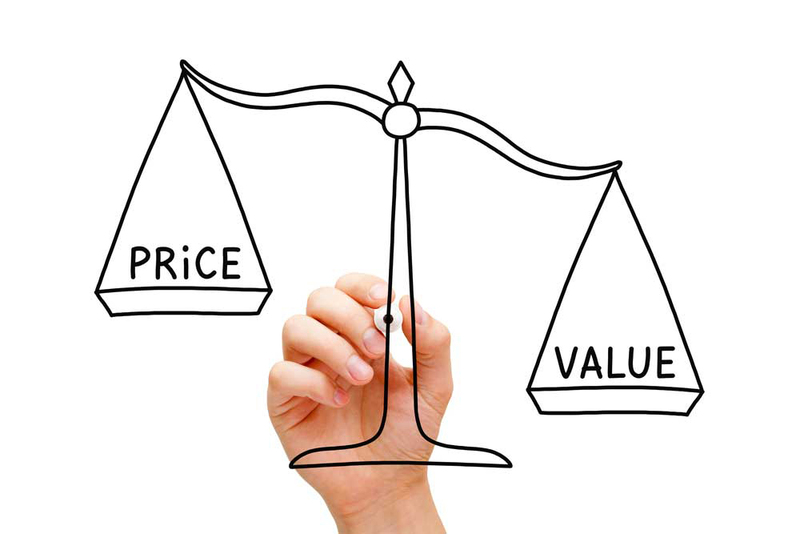 Setting the right price all comes down to knowing your market and understanding your competition. You have to know where your product or service fits into the marketplace and what your direct competitors are charging so you can keep your price on par. If something is too expensive, people are going to go with another option. On the other hand, if your price is too low, potential customers may think something is of low quality or used. So where do you start? John discussed the processes for products and services separately, so let’s start there. Products: If you’re a coffee shop selling premium coffee, you need to look at where else people can get coffee in your community, what products those places are selling and what people are getting for their money. John said to keep in mind that Starbucks can charge more because people are expecting a certain level of quality. Are you in the same market as Starbucks? Is your coffee good enough and your ingredients quality enough to fetch $5 a cup? Once you’ve determined your market, look at your costs. How much does it cost you to buy coffee beans, milk, sugar and equipment? What’s your rent and transportation cost? How much will you need to pay yourself and your staff? How many cups of coffee do you hope to sell a day? John advised that, with a bit of cost analysis, a review of your competition and a decent profit margin built in, you should be able to come up with a number. Just be careful not to undercut yourself. People are OK with spending a bit more if what they’re getting warrants the extra cost, John said. Services: Pricing a service can be a bit trickier and John said he often has clients who undercharge for the services they offer. Just like with a product, it has to start with the market and the competition. If you’re offering a service customers can get elsewhere, figure out what other companies are charging and what sets you apart. John said the biggest mistake people make when pricing a service is undervaluing their own time, knowledge and expertise. Sure, you don’t want to be the most expensive option out there, but you also want to charge enough to make money and what you bring to the table is VALUABLE. Don’t be afraid to charge accordingly. When you’re looking at the numbers, remember to account for the time you’ll be spending on any work you have to do before or after the time of the service as well as any additional costs. John gave a great example – photographers. Sure you have the few hours during the photography appointment, but you also have set-up costs, equipment costs and travel costs in addition to the time you spend editing the photos, meeting with the client, etc. Although those numbers may change from client to client, you need to be sure you’re taking all of that into account when you give a price. If your service is top-notch, you need to charge a premium price. Whether you’re offering a product or a service, John said you have to look at your return on investment and make sure you are able to cover your costs while making enough to live the way you want to live. And if you’ve set a price and things change (like the cost of coffee beans goes up), you have to be comfortable with adjusting that number. He added that people understand that prices change and you need to be proactive in making necessary changes! John Chiaro opened his Growth Coach about eight years ago after retiring from a long corporate career where he held multiple leadership roles with Staples, including the President of Staples International. Chiaro also has led in the merger and acquisition of multiple businesses and was the founding partner of Ward Joseph Consulting before opening his Growth Coach franchise. This entry was posted in Business Coaching and tagged burnout, business advice, business blog, business coach, business onwer, business owner, charging, coaching, competition, how to set prices, investment, marketing, offering service, price, price strategy, product, ROI, sales, service, setting a price, small business, strategic business, strategy, what to charge. Bookmark the permalink.